Location: Termes, in the Aude departement of France (Languedoc-Roussillon Region). Notes: Château de Termes (term in Occitan) is a castle called Cathar located in the department of Aude. At the heart of the limestone massif of the Corbières, Termes is located forty kilometers southeast of Carcassonne. 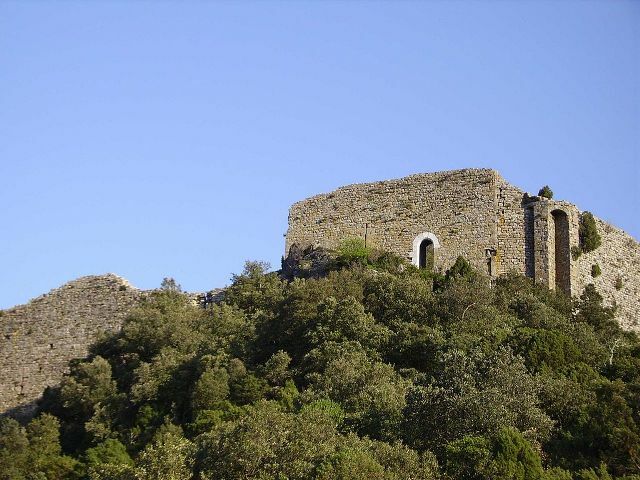 Built on a terrain surrounded by steep slopes on three sides, the castle is accessible only by its southern face. It consists of two concentric walls, and included a dungeon which is no longer perceived as sections of wall collapsed, probably as a result of dismantling the powder in the seventeenth century. The layout of the upper enclosure is only partially visible, mainly in its southern and eastern parts. The lower chamber, best preserved, is approximately 125 meters on 70. It includes various works flanking but the exact route of the southwest corner is no longer perceptible. Several buildings remain inside the two speakers. The rock has largely been built on the south side to form a moat defending the access to the less well defended naturally. On the southern flank of the relief, the remains of walls and a baffle access are to be related to the fortified town of the twelfth century. This village habitat was probably moved further down the valley to its present location after the taking possession by the king of France in the thirteenth century, scenario known for a number of other sites in the Languedoc castral at the same time. Some distance to the north, on a rocky outcrop overlooking the gorge, was a secondary fortified structure, the Termenet, which no longer has that extremely fleeting remnants. From the perspective of dating, some remains of the upper part correspond to the original castle of the Terms of lords and date back to the eleventh - twelfth century. Most of the site was rebuilt in the late thirteenth and early fourteenth century by the royal architects when the terms of site has become a fortress defending the border against Aragon. The great house of the royal era was notably generated in 2007.